Click the button below to add the Adorable Baby Boy Giftbox to your wish list. Delight the new parents with this gorgeous baby boy gift box. Featuring a stylish combination of baby essentials from 4 Little Ducks. 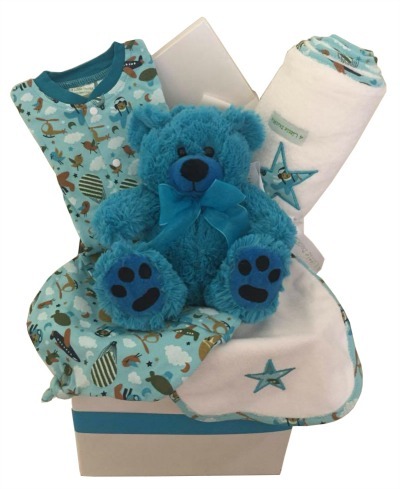 Our gorgeous Baby boy gift box features a beautiful soft velour blanket with a star applique ,a gorgeous long sleeved print romper with matching knotted hat and bib , a cute teddy bear . Your gift is beautifully presented in a gift box with a complimentary gift card,for your own personal message.